We forecast Abbott Labs (NYSE:ABT) to post a double digit revenue growth and adjusted EPS of $2.90 in 2018. We expect the revenue growth to be led by its Diagnostics business, primarily reflecting the gains from the Alere acquisition. 2017 was a good year for Abbott Labs, with a 31% jump in the top line, primarily due to the acquisition of St Jude Medical and Alere. The company struggled to generate significant growth in recent years, which, in part, prompted the company to make two significant acquisitions, and this will boost the company’s top line as well as bottom line in 2018, as well. We have created an interactive dashboard on Abbott Labs’ expected performance for 2018. You can adjust the revenue and margin drivers to see the impact on the company’s performance. Below we discuss our expectations and forecasts for the company. The Medical Devices business is Abbott’s largest segment, and accounts for over 35% of its revenue and gross profit. This business includes minimally invasive medical devices for heart diseases, stroke, carotid artery disease, and the recently acquired St Jude Medical, which led to a 2x segment revenue growth in 2017. We expect mid single digit growth to $11.2 billion in 2018. This can be attributed to Abbott’s robust pipeline in coronary stents, where the company is working on well-staged advances as well as innovative technologies to capture additional market share. Most notably, it is focused on the further clinical development of ABSORB, the world’s first drug-eluting bioresorbable (doesn’t require mechanical removal) vascular scaffolds. In addition, the company has launched new products in diabetes and optics. Its FreeStyle Libre product has seen strong acceptance in Europe, and is expected to do well in the U.S. Looking at the company’s Diagnostics business, we expect the revenues to increase from $5.62 billion in 2017 to $7.86 billion in 2018, primarily reflecting the benefits from the Alere acquisition. It should be noted that Alere generated over $2.2 billion in revenues in 2015 and 2016. The segment revenues will also be aided by the company’s performance in the emerging markets, which have been experiencing rapid growth, and Abbott has focused on expanding its footprint in these markets. Abbott has a strong presence in rapidly growing markets like China, India, and Brazil. In the long run, we expect the company to benefit from its focus on R&D, with new products that can help it gain market share. Abbott has launched new tests to diagnose HIV and cancer, and new molecular assays for cancer and hepatitis. The company is also planning to launch a number of new assays and next-generation systems over the next several years. Expect Steady Growth In General Pharmaceuticals Products, and Nutritional Segment. 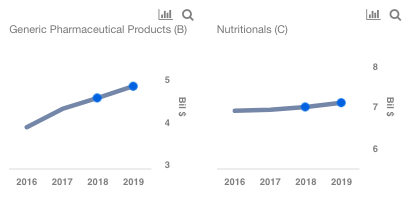 We expect modest growth in the company’s Nutritionals segment while we forecast the General Pharmaceuticals Products segment to grow in mid single digits. It should be noted that Abbott sold its developed markets branded generics pharmaceutical business to Mylan Inc. However, the company retained its branded generics business in developing markets. Emerging markets are growing at a faster pace than developed markets, due to growth in income and healthcare, and this should bode well for Abbott’s branded generics business, as well as the Nutritionals segment. Abbott’s Nutritionals business is likely to be slightly better, as the company adjusts to new regulations in China. Overall, 2018 looks like it should be a good year for Abbott, driven by the full accounting of acquisitions as well as improved organic growth. We also estimate that the stock may have some room for upside. See our interactive dashboard to understand our segment-wise expectations for 2018, and how much the stock can move.